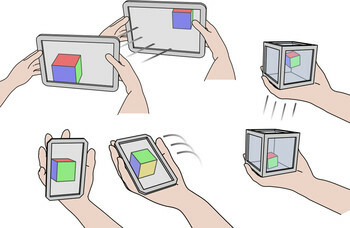 We examine a class of techniques for 3D object manipulation on mobile devices, in which the device’s physical motion is applied to 3D objects displayed on the device itself. This “local coupling” between input and display creates specific challenges compared to manipulation techniques designed for monitor-based or immersive virtual environments. Our work focuses specifically on the mapping between device motion and object motion. We review existing manipulation techniques and introduce a formal description of the main mappings under a common notation. Based on this notation, we analyze these mappings and their properties in order to answer crucial usability questions. We first investigate how the 3D objects should move on the screen, since the screen also moves with the mobile device during manipulation. We then investigate the effects of a limited range of manipulation and present a number of solutions to overcome this constraint. This work provides a theoretical framework to better understand the properties of locally-coupled 3D manipulation mappings based on mobile device motion.